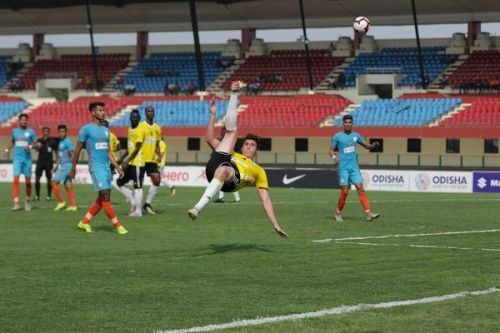 Real Kashmir FC were able to maintain their unbeaten record on the road as they stole a crucial point against Indian Arrows following the 2-2 draw at the Kalinga Stadium in Bhubaneswar on Sunday (February 24, 2019). After 75 minutes of goalless football, suddenly the match sprung into life which saw 4 goals in the final 15 minutes of regulation time. Amarjit Singh (78') found the target from the penalty spot before Kofi Tetteh (82') restored the parity from a well-taken corner by Vicky Meitei. Mason Robertson (90') who was lurking in for a long took the lead once again only to lose it within 60 seconds when Rahul KP headed an Anwar Ali corner home. On the other hand, Real Kashmir FC coach David Robertson didn't feel to tweak in his strategies having fielded the same starting eleven. Four minutes later, the visitors came very close to opening the scoreline once again from Surchandra's corner. The corner landed deep in the penalty box and it was laid off to Bazie whose feeble touch was cleared off by Lovepreet comfortably. Rahim Ali won a penalty in the 75th minute when his powerful effort from outside the box hit Ravanan's hand and the referee didn't hesitate to award the youngsters a spot-kick. Skipper Amarjit slotted it calmly past Bilal Khan to send the Arrows dugout into a delirium. The Srinagar-based outfit changed the gear immediately and finally, they got the elusive goal in the 82nd minute. Vicky Meitei's corner dipped near the goal and Abednedo Tetteh, who replaced Krizo, leapt high to find the back of the neck. Their joy was cut short by super-sub Rahul KP who did no mistake to score from a copybook header goal from Anwar Ali's well-taken free-kick in the first minute of the added time to leave the ground with a point from their final home fixture of Hero I-League 2018-19.